This blog has been running for maybe a year now, and now that it’s purpose is begging to emerge for me, I thought that it was now time to try and write a little bit more on what this blog is about, now that things are becoming clearer for me. You cannot solve a problem from the same consciousness that created it. You must learn to see the world anew. Many people like to quote this, but they do not always address exactly what “consciousness” is, and how we can make the move to a new way of seeing. Consider the following diagram below. Can you see any thing in amongst the random shapes? 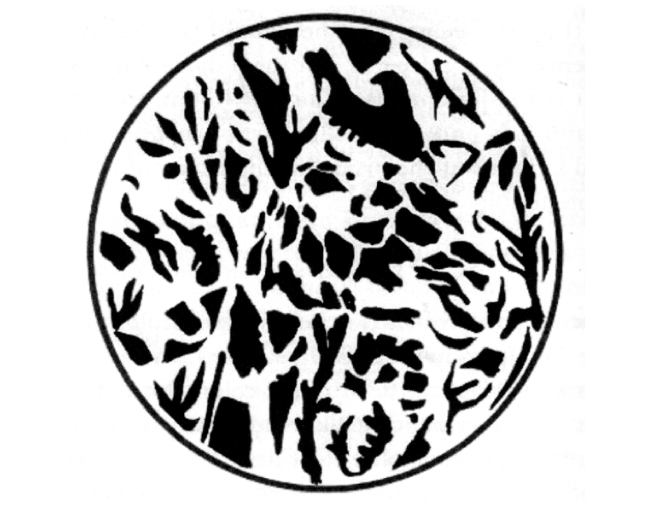 This example comes from Henri Bortoft, who describes it in his book “The Wholeness of Nature.” Sometimes people take time to see the hidden figure in the diagram, and others can not see it at all. Rather than spoil the game, I will tell you what figure is hidden in the picture at the end of this article. Bortoft uses this example, and many others, to show us that before we can “see” we have to have what he calls an “active idea”. It is this active idea that enables us to see, that enables the hidden figure to be seen. In science especially, many people often think of the world as existing independently from us, and that all we have to do is examine this world rationally, objectively, and impartially, and the facts which are already “out there” will present themselves to us. Many people looked through telescopes, but it took Galileo to “see” mountains and ravines on the surface of the moon. Likewise, many great thinkers thought that it was impossible to classify the clouds in the sky, until Luke Howard published his paper “On the modification of clouds” in 1806. I could of course talk for many hours on how to understand science, we have to understand the history of science, and how we can not separate the science from the social and economic orders of their times. But leaping forward, passing Newton’s great mechanistic contributions to science, the advances in understanding light, and electricity, heat and gravity, and also bypassing the very strange world of quantum physics, we find ourselves in a new era of science, one of chaos, complexity and emergence. There have been many advances in the last few decades, enabled by the phenomenal growth in computing power and computational capabilities, and many of these have struck a deep chord in society, such as the mesmerising animations of fractal mathematics, especially Mandlebrot sets. Other concepts to have made an impact away from physics, biology and chemistry into into social, psychological, economic and business thinking include strange attractors, bifurcation points, and what is popularly known as “the butterfly effect”. Now here is the thing. Chaos and complexity are import to you because it can teach you a new way of thinking, and this way of thinking is inspired by nature. Chaos and complexity give us a new way to talk about nature and the world we live in. However, the reason why people struggle to “get” chaos and complexity is that it requires not only a new way of thinking but a new way of knowing. In strategic management thinking, I often see the concepts of chaos and complexity alluded to, but can’t help but think that that those who are attempting to apply the concepts of chaos theory into business are just confusing not only their clients but themselves. For often there is little awareness of the fact that the word “chaos” could be thought of as badly named, since many discoveries are in fact telling us that what we once thought of as chaotic phenomena, do in fact exhibit ordered behaviour, but this order is of a deep and hidden order, that initially we are not able to “see”. Will you teach your children what we have taught our children? That the earth is our mother?What befalls the earth befalls all the sons of the earth.